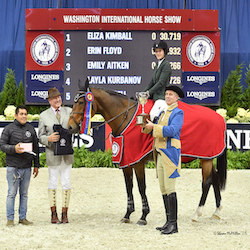 WASHINGTON, October 16, 2015 – Saturday night will offer a memorable experience at the 57th annual Washington International Horse Show, with a full schedule packed with exciting competition and entertaining exhibitions. There is something for everyone on the biggest night of the show! The $125,000 Longines FEI World Cup™ Jumping Washington, presented by Events DC, for the President’s Cup, is the featured event. It is preceded by the WIHS Equitation Finals, a freestyle dressage exhibition by Allison Brock and Rosevelt, and the final race in the WIHS Shetland Pony Steeplechase Championship. Throughout the night, festivities will be held at the President’s Cup Party, which benefits the USET Foundation’s “Ride to Rio” Olympic athlete program. 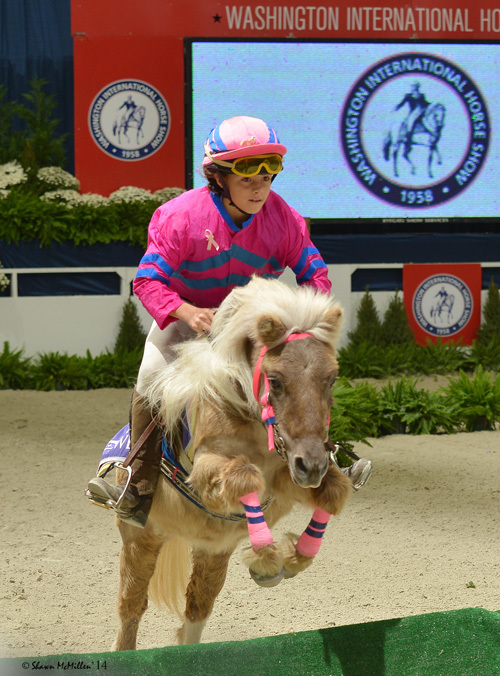 The 2015 WIHS runs October 20-25, 2015, at Verizon Center in downtown Washington, D.C.
One of the world’s most esteemed equestrian competitions, WIHS draws some of the most well-known names in the sport, including Olympians and rising young stars. 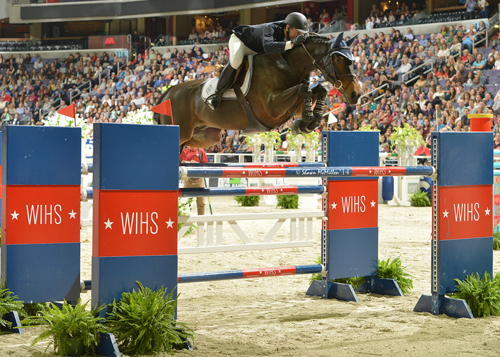 The highlight event of WIHS, the $125,000 Longines FEI World Cup™ Jumping Washington, is one of the most prestigious show jumping competitions on the competition calendar. It has been selected as one of seven events to comprise the East Coast division of the all-new Longines FEI World Cup™ Jumping North American League. Riders will be competing for points to qualify for the 2016 Longines FEI World Cup™ Jumping Finals in Gothenburg, Sweden. McLain Ward and HH Carlos Z, winners of the 2014 President's Cup Grand Prix, presented by Events DC. © Shawn McMillen Photography. This year’s Pan American Games individual gold medalist and two-time U.S. Olympic team gold medalist McLain Ward will return to defend his title as 2014 winner of the WIHS President’s Cup grand prix. The night will begin with the top 10 work-off for the WIHS Equitation Finals. Spectators will watch the top junior riders in the country ride for the coveted championship, one of the biggest goals of the season. SAP, the official Technology Sponsor of WIHS, created a new equitation judging app, which will allow audience members to judge the Finals live from their seats at Verizon Center or as they watch the live stream. 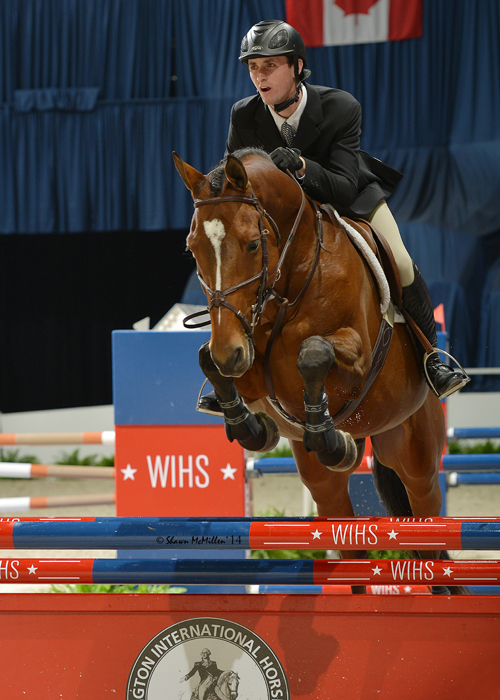 2014 WIHS Equitation Finals Champion, Michael Hughes. © Shawn McMillen Photography. The 2015 WIHS Hall of Fame Induction Ceremony, presented by The Boeing Company, will take place on Saturday evening as part of a special night celebrating the United States Equestrian Team and will honor Rodney Jenkins. The ceremony will be a special moment in the ring following the conclusion of the WIHS Equitation Finals and before the $125,000 Longines FEI World Cup™ Jumping Washington class, and will feature a special tribute video and the presentation of the WIHS Hall of Fame Trophy. Jenkins’ professional career started in the early 1960s and includes more than 70 grand prix wins. Although some current grand prix riders have more wins, few can match the quality of classes he won, his consistency, or his longevity. Some of his biggest wins were the President’s Cup Grand Prix at WIHS, which he won four times (1970, 1971, 1976, and 1983). In 1989, Jenkins announced his decision to retire from the show ring. Since then he has focused on training racehorses. The WIHS Hall of Fame is a very prestigious honor, recognizing leaders in the world of equestrian sports. The first inductee was equestrian legend George Morris in 1997, and since then 10 individuals have been inducted. Not to be missed are this year’s entertaining Saturday night exhibitions. Allison Brock will be riding Fritz and Claudine Kundrun’s beautiful 2002 Hanoverian stallion, Rosevelt, in an elegant WIHS dressage exhibition, presented by Deloitte. They will perform a crowd-pleasing grand prix freestyle to music (Kür), where the horse and rider performs specially choreographed patterns to music. 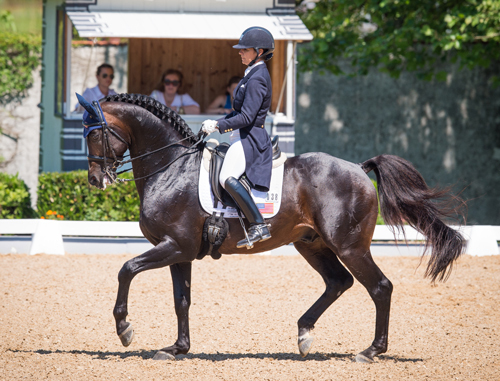 Allison Brock and Rosevelt will preform a dressage freestyle exihbition, presented by Deloitte, on Saturday night. © Shannon Brinkman. Following Brock’s dressage exhibition is the adorable WIHS Shetland Pony Steeplechase Championship race, presented by Charles Owen. The steeplechase is modeled after professional races, with riders in colorful silks, a bugler, race caller and even a photo finish, but in miniature. Guided by their jockeys, youngsters age seven to 14, the traditional Shetland Ponies race over a course of tiny hurdles. WIHS Shetland Pony Steeplechase, presented by Charles Owen, is a crowd favorite. © Shawn McMillen Photography. Overlooking the arena and adding to the illustrious night is the President’s Cup Party in the Acela Club, co-hosted by The Young Nelson Society of Washington, WIHS’s newest young philanthropic professionals group. The team spirit will be celebrated at the Acela Club, where ticket proceeds for the President’s Cup Party will be donated to support the USET Foundation’s “Ride to Rio” initiative, which supports the U.S. teams aiming for the 2016 Olympic and Paralympic Games in Rio de Janiero, Brazil, to help them win medals and stand on the podium. The party includes an open bar, dinner and the show. Guests, including business, government and diplomatic leaders, will be welcomed by the CityCenterDC red carpet and enjoy an evening of dinner, drinks, and socializing. Washington Life magazine will be photographing the party for their Winter issue, and there will be a beer tasting from Breckenride Brewery and a book signing with Vicki Moon, author of the new book, The Stylish Life Equestrian. Party tickets include dinner and open bar and are $150. Tables are also available. Visit www.wihs.org/social-events to purchase or call 202-525-3679. Don’t miss the biggest and most exciting night of the week at WIHS! Tickets are available at the Verizon Center box office, online at www.Ticketmaster.com or by calling 1-800-745-3000. For group discounts, contact Verizon Center Group Sales at 202-661-5061. For more information on tickets and discounts for military, seniors and students, visit http://www.wihs.org/tickets/. Established in 1958, the Washington International Horse Show is one of the most prestigious equestrian sporting events in the U.S. More than 26,500 spectators attend the six-day show, which includes Olympic-level competition along with community and charity events. More than 500 top horses and riders come to D.C. from all over the globe to jump for more than a half a million dollars in prize money. Event highlights include the $125,000 Longines FEI World Cup™ Jumping Washington, presented by Events DC, for the President’s Cup (Saturday night), The Boeing Company Puissance high jump competition on Military Night (Friday) and Kids' Day (Saturday), a free, fun and educational community event. The Washington International Horse Show Association, Ltd. is a 501(c)(3) nonprofit charitable organization headquartered in Washington, D.C. WIHS is an official USEF Heritage Competition and is recognized as a Top 25 Horse Show by the North American Riders Group. WIHS is rated CSI4*-W by the Fédération Equestre Internationale, the world governing body for horse sports. Established in 1958, the Washington International Horse Show is one of the most prestigious and entertaining equestrian events in North America. More than 26,300 spectators attend the six-day show, which includes Olympic-level competition along with community and charity events. More than 500 top horses and riders come to D.C. from all over the globe to jump for more than a half a million dollars in prize money. Highlights include the $135,000 Longines FEI Jumping World Cup™ Washington for the President's Cup presented by Events DC, the $25,000 Land Rover Puissance high jump on Military Night, the Lindsay Maxwell Charitable Fund WIHS Equitation Finals, and Kids' Day, a free, fun and educational community event. WIHS, an official USEF Heritage Competition, is rated CSI4*-W by the Fédération Equestre Internationale, the world governing body for horse sports.